Over the past few years, hyaluronic acid has received significant attention from both the medical press and the cosmetics sector. It’s a polysaccharide macromolecule from the glycosaminoglycan family which is abundant in the skin and synovial fluid (the viscous fluid surrounding our joints). Under normal conditions, the human body contains around 12g. It’s produced by cells called chondrocytes and synoviocytes to increase the viscosity of synovial fluid, which improves lubrication of the joints. It also helps maintain good hydration in the skin by capturing water and retaining it in the skin’s deeper layers (1). In some cases, it also reduces the concentration of inflammatory mediators and activity of immune cells. The viscosity of the gel depends on the chain length of the hyaluronic acid. The higher its molecular weight, the greater the molecule’s capacity for absorbing water. Therefore, with a molecular weight of 1.2 million Daltons, Hyaluronic Acid 150 mg is one of the best sodium hyaluronate supplements available. by bacterial fermentation: strands of hyaluronic acid are produced from innocuous bacteria. Hyaluronic Acid 150 mg is made using the second of these methods. It is therefore 100% suitable for vegetarians and vegans and offers guaranteed, controlled optimal purity. The human body is itself able to produce hyaluronic acid via a mechanism discovered around 20 years ago by Professor Paul Weigel and his team. Synthesis occurs at the inner side of plasma membranes and is a fast, effective and unique process. What are hyaluronic acid’s properties? 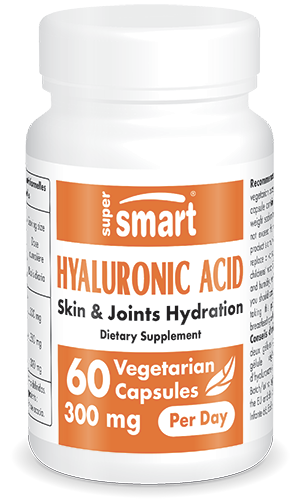 Hyaluronic acid is present in the form of sodium hyaluronate (also called hyaluronan) in the synovial fluid surrounding joints. It usually has a molecular weight of more than 1 million Daltons and under normal conditions, is highly concentrated. As a result of its specific structure and considerable size, it can retain enormous amounts of water (up to 1000 times its own weight), and all the nutrients and hydrophilic substances that go with it. It is solely responsible for the viscosity and elasticity of synovial fluid. In certain disease states, both the concentration and molecular weight of sodium hyaluronate decrease, contributing to an increase in inflammatory processes and adverse effects on cartilage (2). Is high molecular weight hyaluronic acid well-absorbed? It was long believed that when taken orally, hyaluronic acid had no real clinical benefit because of its particularly high molecular weight. In fact, the bioavailability of orally-administered hyaluronic acid is well-documented (3). Animal studies, which were somewhat late in investigating this question, have shown that when administered orally, part of the hyaluronic acid molecules are perfectly capable of reaching the bloodstream and various body tissues. This discovery concurs with the recorded effects of hyaluronic acid supplementation in horses and other animals (4-6) as well as in humans (7-8). It’s believed that these molecules cross the gut wall via micro-particles (9-10) and that part of them reaches peripheral tissues such as the skin and joints without any difficulty. The transport of hyaluronic acid in the body is, in any case, a completely normal physiological process (11-12). It’s therefore entirely appropriate that hyaluronic acid should be available in dietary supplement form (13-15). Supplements represent an alternative to the HA injections given by health professionals and recommended by the European League against Rheumatism (EULAR). Why is it better to take high molecular weight hyaluronic acid? Studies show that low molecular weight hyaluronic acid molecules have a completely different function in the body: they can activate cascades of molecular events which trigger the release of inflammatory cytokines. Following trauma, enzymes break the hyaluronic acid up into multiple molecules of lower molecular weight which have a pro-inflammatory effect. These effects are not seen with large hyaluronic acid molecules, which supports the belief that they are not broken down by digestive enzymes before crossing the intestinal barrier. What other measures can be combined with taking Hyaluronic Acid 150mg? Should hyaluronic acid capsules be taken every day? The life of a hyaluronic acid molecule is relatively short, ranging from 12 hours to a few days. It’s thought that a third of the body’s total hyaluronic acid composition is renewed each day under normal circumstances. A daily dose of two 150mg capsules is therefore recommended. This dose is not associated with any adverse side-effects, whether taken for short periods (two weeks) or indeed for up to 12 months. The huge advantage of this method is that it offers an alternative to painful and sometimes dreaded injections. Oral administration of hyaluronic acid is simple and safe and produces the same results as those demonstrated in recent scientific studies. It’s worth noting that there is no difference between men and women in terms of the treatment’s activity.